Not to be confused with Angel Island Zone. Angel Island, as depicted in Sonic & Knuckles. The Sonic & Knuckles title sequence shows the Death Egg crashing atop Angel Island's Lava Reef Zone volcano. Angel Island (sometimes called the Floating Island) is a fictional floating island high in the air in the world of the Sonic the Hedgehog video game series. It was first introduced in the video game Sonic the Hedgehog 3. The island is the home of the Master Emerald, a large and powerful green gem that is protected by Knuckles the Echidna and also keeps the Angel Island itself suspended in the sky. The Master Emerald is able to control the Chaos Emeralds, which are an important plot device in many Sonic the Hedgehog stories and games. In some continuities, there is a selection of Chaos Emeralds on the island itself. 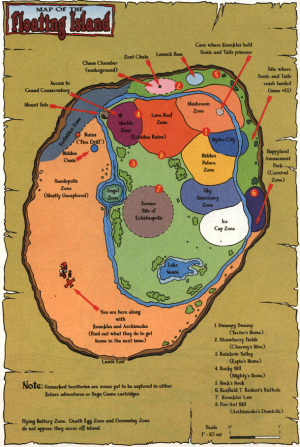 A map of Angel Island, known as the Floating Island, in the Archie comic continuity. It should be noted that this version of the island presents major differences by comparison with the games' incarnation, as its origin and backstory differ greatly. Angel Island was formed in the aftermath of the first Perfect Chaos cataclysm, following Chief Pachacamac's assault on the Emerald Shirne. When Tikal sealed herself and Chaos inside the Master Emerald, the energy backlash from the gem carved a vast swathe of land out of the surrounding Mystic Ruins, and launched the floating continent into the air (Sonic Chronicles: The Dark Brotherhood, Codex). What survivors of the Knuckles Clan remained on Angel Island apparently took it upon themselves to guard the Master Emerald from then on, creating the Hidden Palace Zone as a shrine for the great gem and Super Emeralds. Four thousand years later, Knuckles the Echidna is the very last descendant of the clan and sole protector of the Master Emerald. According to most versions of the story, when Dr. Eggman's Death Egg crashed on Angel Island after Sonic the Hedgehog 2, he tricked Knuckles into thinking that Sonic wanted to steal the Master Emerald, when it was actually Eggman who wanted it. Sonic managed to convince Knuckles of his innocence, after which they stopped Eggman together and became friendly rivals. Angel Island has served as a location for several events in many Sonic the Hedgehog games, and has also appeared in other related media. It was an important location in the Fleetway comic, Sonic the Comic, though its introduction occurred much as it did during the games themselves. Angel Island has fallen to sea level several times since its first appearance. It fell for the first time when Eggman's Death Egg crash landed on it in the events of Sonic 3 & Knuckles, and later fell again in Sonic Adventure (and presumably in Sonic Adventure 2) when the Master Emerald was shattered. 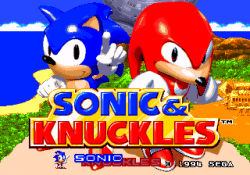 Both games involved long stretches in which Knuckles searched for fragments of the Master Emerald. At some point in the future of Sonic's world, Angel Island is renamed Onyx Island. It is under this name that Eggman Nega warps the entire island back in time during Sonic Rivals. Sonic 3's Angel Island Zone. Angel Island Zone is the name of the first zone in Sonic the Hedgehog 3, where Knuckles is introduced. The environment of the stage is that of the tropical beach resort similar to Green Hill Zone (of Sonic 1) and Emerald Hill Zone (of Sonic the Hedgehog 2) with the exception that halfway through, the zone gets firebombed by Eggman and ends up in flames. However, the entire game of Sonic the Hedgehog 3 (as well as its immediate follow-up, Sonic & Knuckles) was set on what is now known as the Angel Island (but was then known generally as the Floating Island). 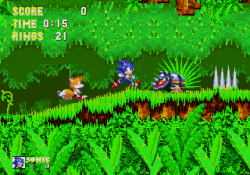 Angel Island Zone is also the fifth zone in Sonic Advance. This time, however, the zone is not a beach area but one of mountains and ancient ruins most similar to Marble Garden Zone from Sonic 3. Sonic Chronicles's Angel Island area. Angel Island appears as an area in Sonic Chronicles: The Dark Brotherhood. During Chapter 5 (named Battle for Angel Island, appropriately enough), Sonic and Knuckles battle the Nocturnus Clan echidnas in a (failed) effort to prevent them taking the Master Emerald into the Twilight Cage. 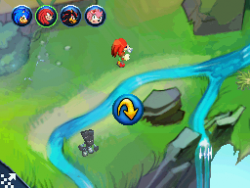 This location most closely resembles the Knuckles Clan pyramid-temples seen in Sonic Adventure's Mystic Ruins adventure field. Angel Island has been referenced in the games Sonic the Hedgehog 3, Sonic & Knuckles, Sonic Adventure, Sonic Adventure 2, Sonic Rivals, and in the comics Sonic the Hedgehog and Sonic the Comic. It can also be seen floating in the background of the Dream Fencing stage of Mario and Sonic at the Olympic Games. Angel Island also makes an appearance in the initial cutscene of Sonic Mania, similar to the beginning of Sonic the Hedgehog 3. Sonic and Tails arrive because they feel a strange energy emanating from the island, and come face to face with a group of Eggrobos digging to find the Phantom Ruby.It also appears as a stage in Sonic Mania Plus at the beginning of Encore Mode. This page was last edited on 6 October 2018, at 10:29.